So I met this guy. He was cute and very sweet. We had a very good first date. At the end of the date he gave me a gift. He made me homemade chicken noodle soup because that week I wasn't feeling well and I had told him that chicken noodle soup made me feel better. If that's not a story that explains Dan I don't know what is. Not long after I met him he told me that he found a lump on his testicle. He went to the doctor and the doctor said it didn't seem like cancer. Dan had waited about 6 months since he first found it and by then it would have been the size of a grapefruit. He told Dan to get an ultrasound to be sure but like a lot of people,Dan didn't follow through right away. Time went on and we didn't think a whole lot about the growth. Few months later I told him it might be time to get it looked at again. It looked bigger. I nagged him for a few weeks. He finally went and here we are. He's had a nut removed. He's been classified as stage 3 m1. He's got another tumor. It's a big one. He will begin chemo in September 2017 and once they say he is done he will be having a surgery to remove the last tumor. It will be a big surgery we are told. Dan doesn't like to ask for help. He's the kind who wants to make people chicken noodle soup because they have a runny nose. So I have set this up for him. Anything is appreciated more than you know. So an update. Life has been a bit crazy. Dan finished 4 rounds of chemo in November. We had planned to have a big ole tumor removed in December. In the between time, Dan's blood work started to come back irregular. After a few weeks the doctors told us that the cancer was back... Someplace. We weren't sure where. We prepared for salvage therapy and tried to get through the holidays. The day after Christmas Dan and I were texting while I was at work. He told me something was wrong because he was having trouble understanding what I was dating. As I can sometimes be wordy and phrase things odd I told him we all have stupid days and it probably wasn't much. After more talking it became clear it was something. I called around to get someone to check on him at home. His parents were able to get him on the phone and confirm a problem and they called an ambulance. Dan passed out pacing his house but the medics were about 5 min out. He went to the Er and I met him there. He had had a seizure. I told them to look in his brain. He is a cancer patient and that if it spread it was going to the brain. Sure enough they found 2 tumors. Now he's been through radiation and we have started salvage therapy at University of Chicago with stem cell replacement therapy. They think this should take out the Lance Armstrong type of testicular cancer. 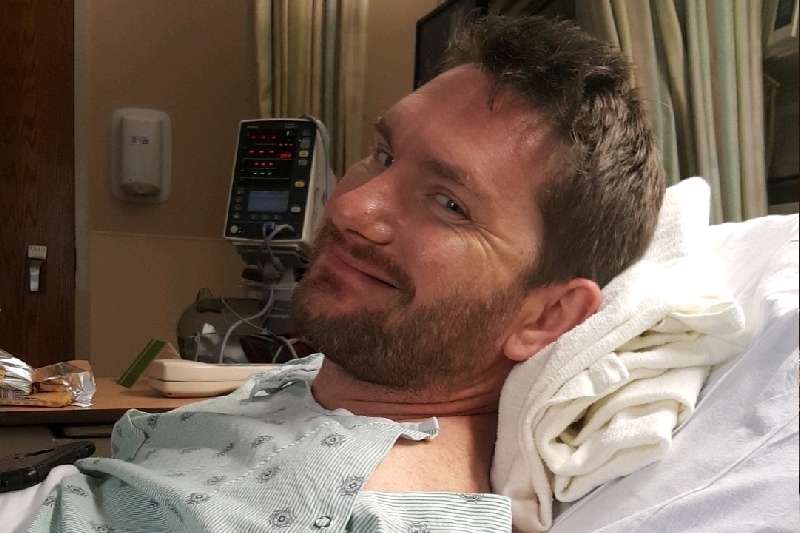 Dan is in good spirits now. As proof, here's a picture of date night in the cancer ward. 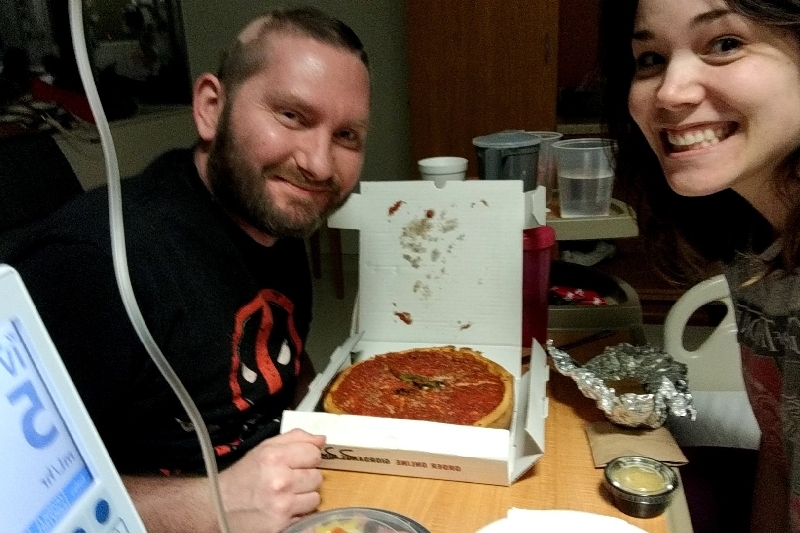 Chemo patients totally eat deep dish right? Now that this is getting donated to again I should probably up date y'all. Dan began his treatments a week early as I'm sure most of you know already. Nothing "new" is really happening in cancer land though. Chemo land is different. Dan finished his first round. It was not easy. His second round is starting Monday and he's not looking forward to it. He has lost most of his hair as of this post. When it happens it happens fast. His friends have been great about food and loving comments. On Monday if you wanted to shoot him a "you're killing it man" or a "you got this bro" I'm sure he would love it, even if he doesn't respond. Chemo takes everything out of him. He barely even speaks to me. He sleeps as much as he can. But again we wish to thank you all. The support has been amazing. He appreciates it more than you can know. So you guys have blown us away with this. Wow. That's amazing.